I have arrived in Las Vegas for Defcon and Black Hat (not in that order). 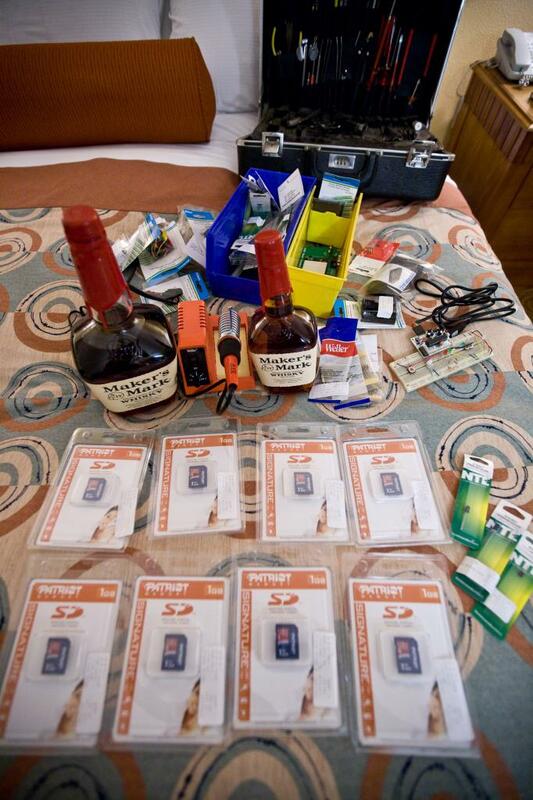 I love Defcon. I believe this will be my 8th year at the 'con. I've been covering it for Wired since last year and for my own blog the year before. 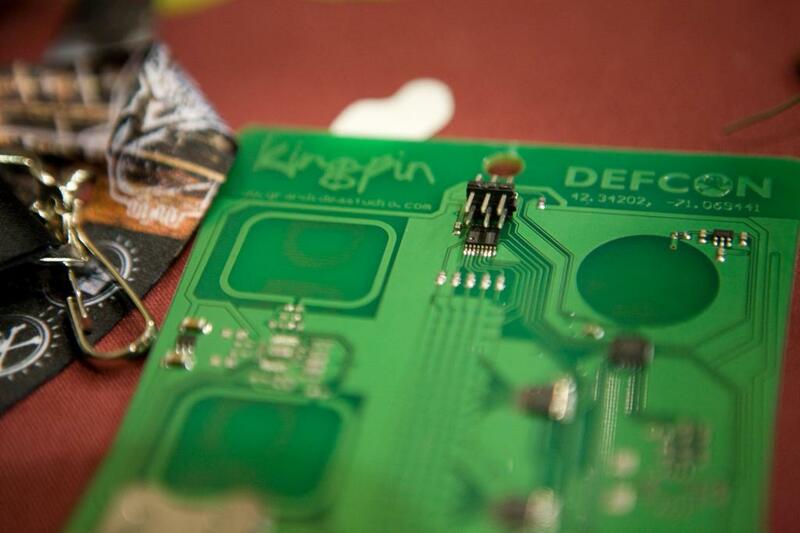 I also posted a sneak peek of the Defcon 16 badge on Wired.com earlier this week. I can't wait to get my hands on a production version. A nice selection of supplies covers my bed including 8 SD cards (for friends), IR LEDs, a soldering station, a bare bones arduino, a breadboard, various components and Maker's Mark. 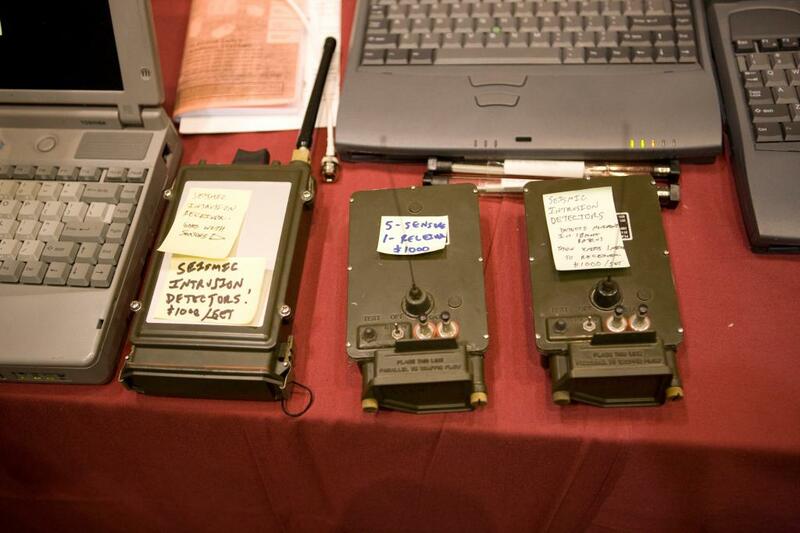 More after the jump, and the whole archive can be found in my Defcon 15 gallery. 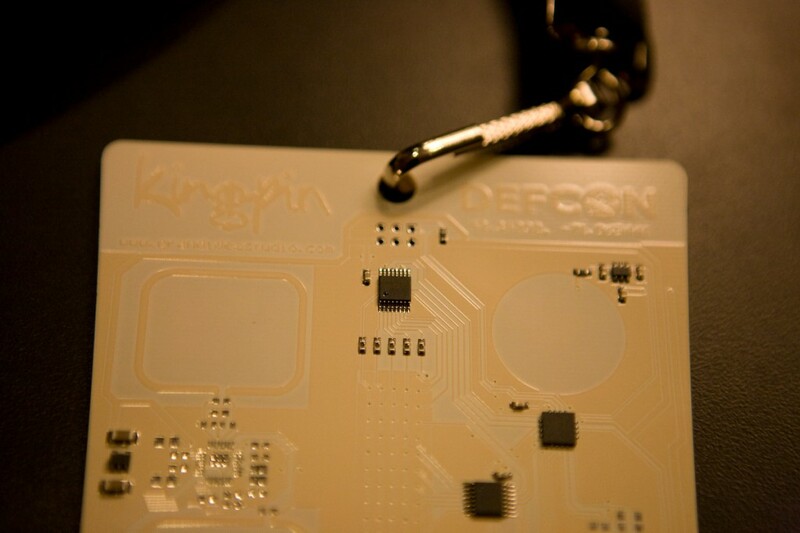 Yesterday at Defcon I went to the vendor area to pick up the Zigbee and accelerometer chips for my awesome Defcon badge. Unfortunately they were out of both chips, but they did let me borrow their soldering iron and gave me some leads to solder onto my badge. I soldered these leads on in a minute or two and then attached my badge to their laptop which had the freescale programming software on it. I modified the source code, which is actually in C, simply changing the hard coded message from "I <3 DEFCON" to "eecue.com." Changing this, meant that as soon as I powered up the badge it displayed that instead of the default message, and also changed the POV message. 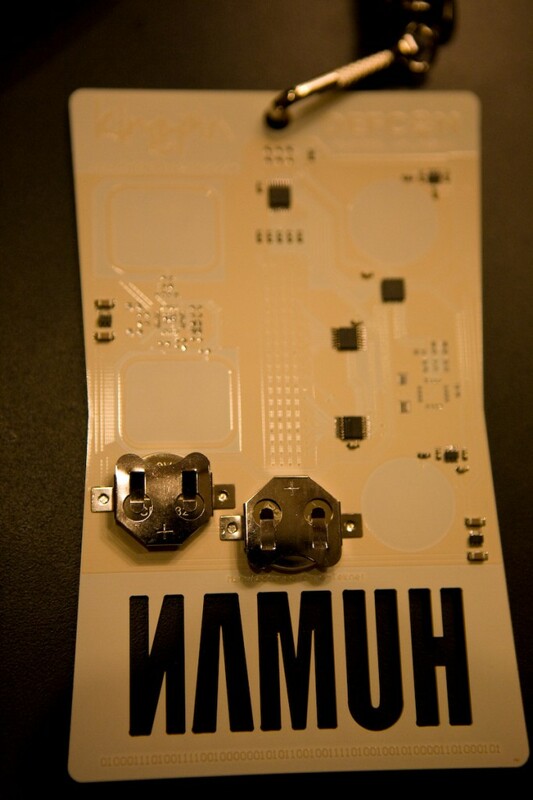 After modifying the code, I recompiled the firmware and flashed it to the badge. The hack was simple and in total took me about 10 minutes. According to the guys at the booth and Joe Grand (the badge's designer) I was the first person at the con to hack a badge. Today I am planning on picking up my own Freescale programmer and the accelerometer chips which should be in stock, and hopefully I'll find some time to modify the badge in more interesting ways. This simple hack has been written up on Wired's 27bstroke6 blog (whom I have been employed by for the duration of the convention as their staff photog), Gizmodo and several other places. 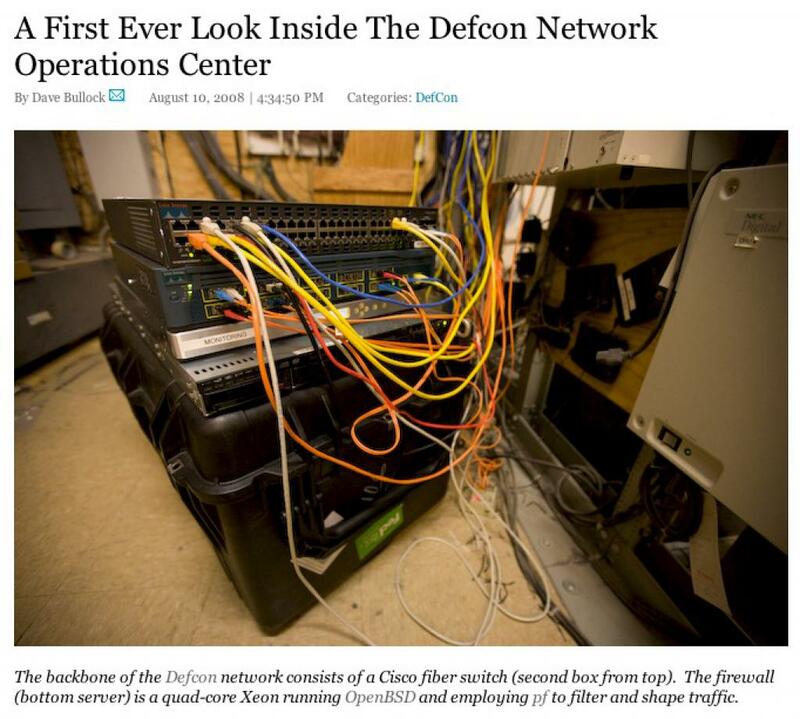 As everyone in attendance should know, the Defcon network is probably the most dangerous and hostile network in the world. 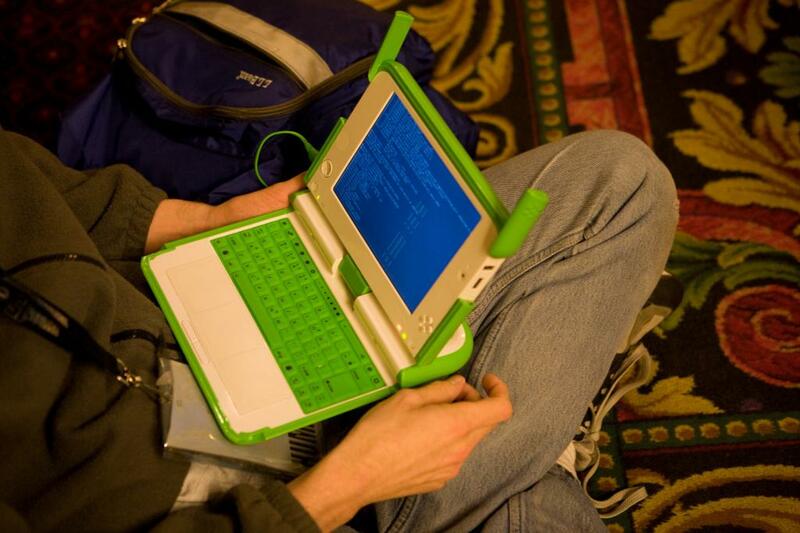 No network is secure, but the wireless network at Defcon is totally insecure with thousands of hackers and script kiddies sniffing traffic and actively attacking ever system they see. This is one reason why I've made it a habit to use an out of band connection for my internet needs. My out of band network of choice is EVDO, but even with that I still send all my traffic through an ssh tunnel to a trusted host. Verizon's EVDO uses ppp to assign you system a public internet address, and I'm guessing that the IP range varies from city to city. It's no surprise that people know about this as evidenced by the logs below that show port scans bouncing off my firewall. One of the talks coming up today is "Hacking EVDO," and I was a bit worried that someone had figured out how to sniff EVDO traffic. I happened to run in to King Tuna, who is giving the talk and asked him about what he had found. He told me that currently the protocol is still secure, but that he had found a vulnerability in one of the chipsets which he has written an exploit for. The point of his research was to inspire other people to work on the protocol and break it. The logs from my firewall can be found after the jump. 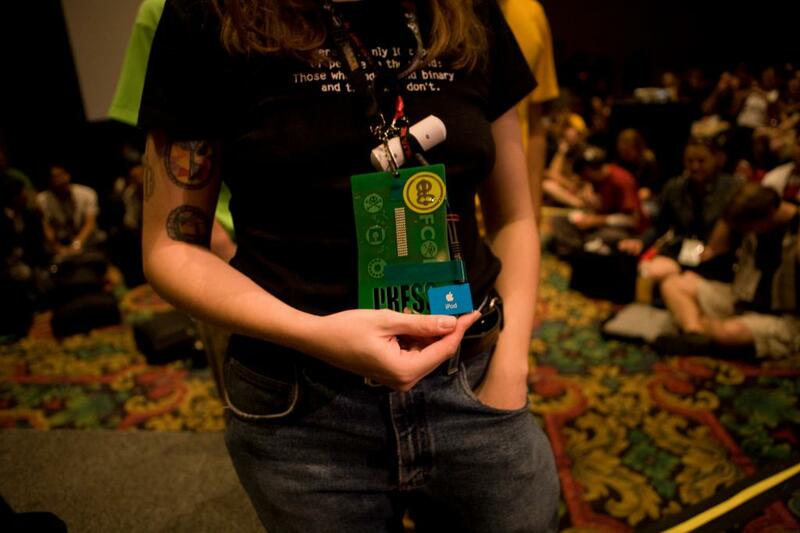 I just got my wife's badge for Defcon (they're not giving out press badges 'till tomorrow) and it is totally and completely awesome. At first when I put the batteries in, the LEDs lit up and then nothing happened. I tried shorting a few pins together on the back to no avail and then by accident I figured out that the front has two buttons, which are the smiley skull and the dial. After pressing the buttons it scrolled some text about Defcon, and then I hit the buttons a few more times and saw POV, which stands for persistence of vision. 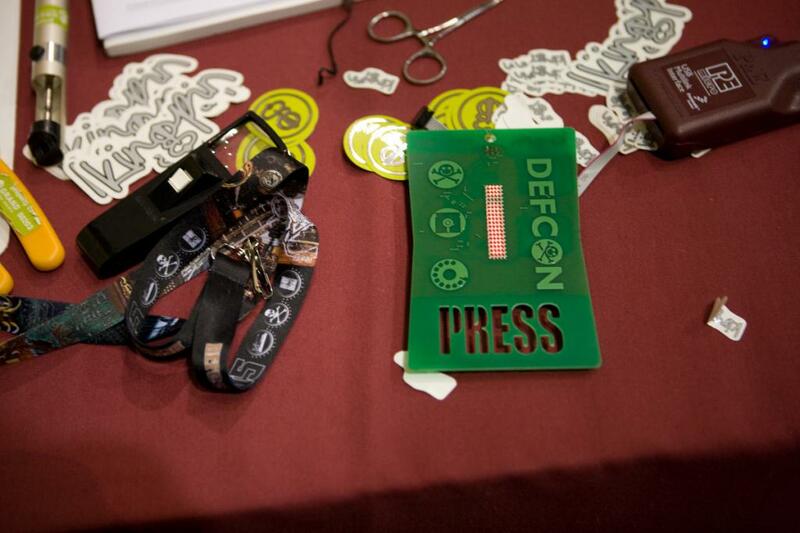 I swung the badge around and saw the word defcon, just like the cool spoke POV kits. Then I pushed the buttons a few more times and it displayed: TEXT. I held both buttons at once and I was able to program in 15 characters of text using the buttons to navigate and pressing them both at once to select a letter. I choose: "EECUE[HEART]PENELOPER^" with the heart being an actual heart symbol. The badge offers a full upper and lowercase alphabet along with an assortment of symbols and punctuation. After adding the 15 characters the text began to scroll in a marquee fashion. This is the dopest badge ever. 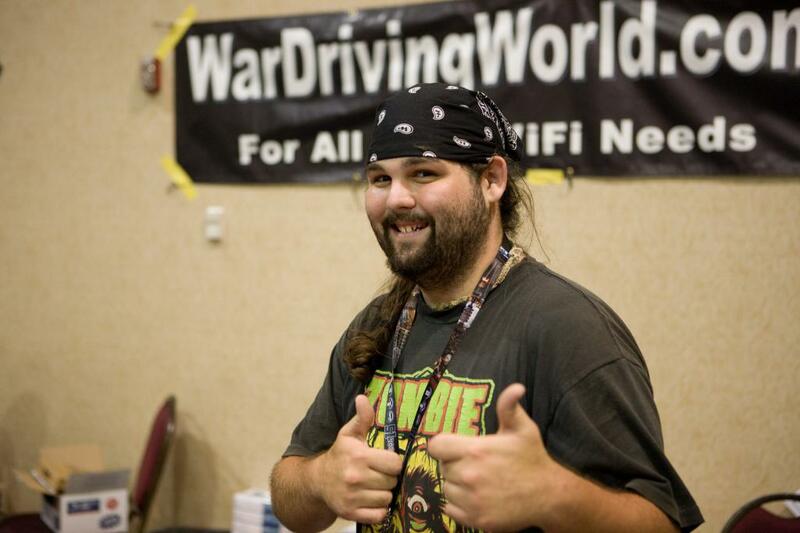 Hell yeah and way to go Defcon! Photos and words coming soon. So believe it or not I have been slammed at work since I got back from the con and I really haven't had any time to sort my photos and write about my experiences at DEFCON, or at the parties I attended. I just got back from the walking tour of Downtown LA focusing on the Art Deco buildings in the area. I took some photos and I'm going to both sort those and the DEFCON pics and upload tonight.... oh and another thing... if I have time tomorrow I will be releasing a few more pages of LA from an Auto. Oh my it must be a chilly day in hell as Penelope posted two entries on her site!!! One is a review of defcon... good job sweetie! 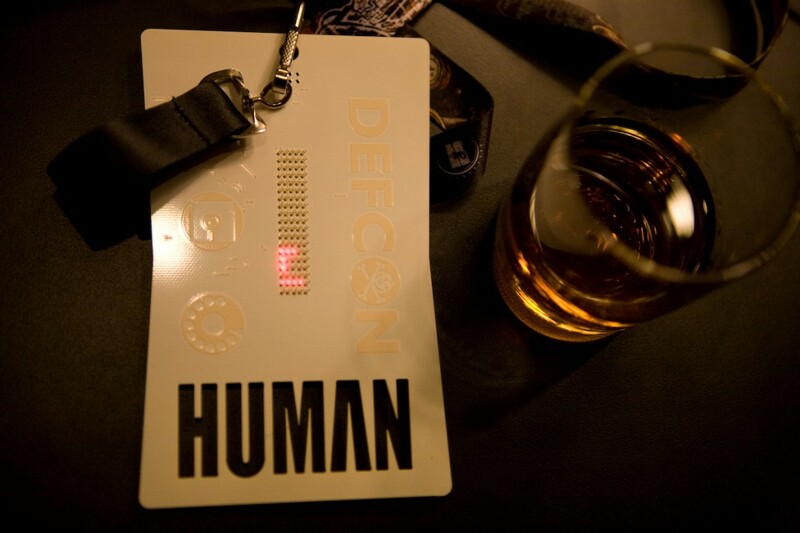 Once a year hackers, crackers, geaks, freaks, drunks and gun toting maniacs get together in Las Vegas for the security convention known as DEFCON. Although the con has many speakers and events in the past I have gone to eat, drink and be merry in LV and this year will be no exception as thoughts of Nobu, Bellagio Buffet and Habeñero Rum dance through my head. 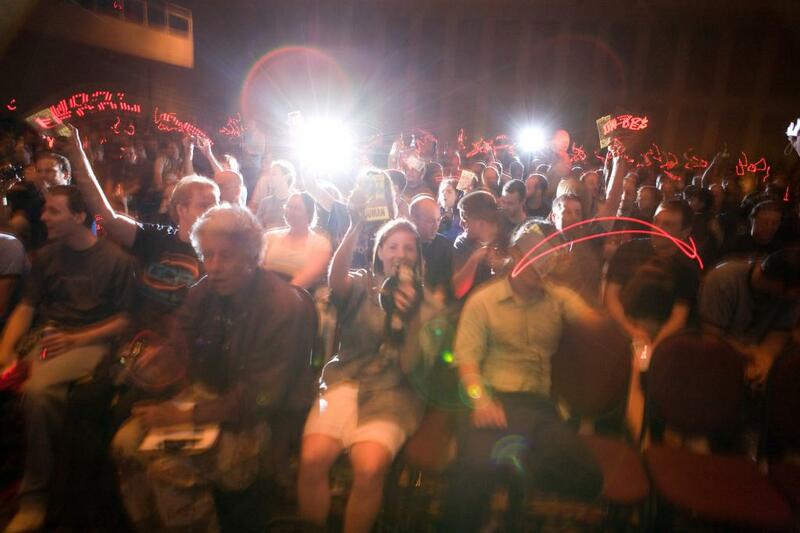 23b.org (which I host / am a member of) is a great spot to find photos from the con both past and present. If you're going, I'll see you there! 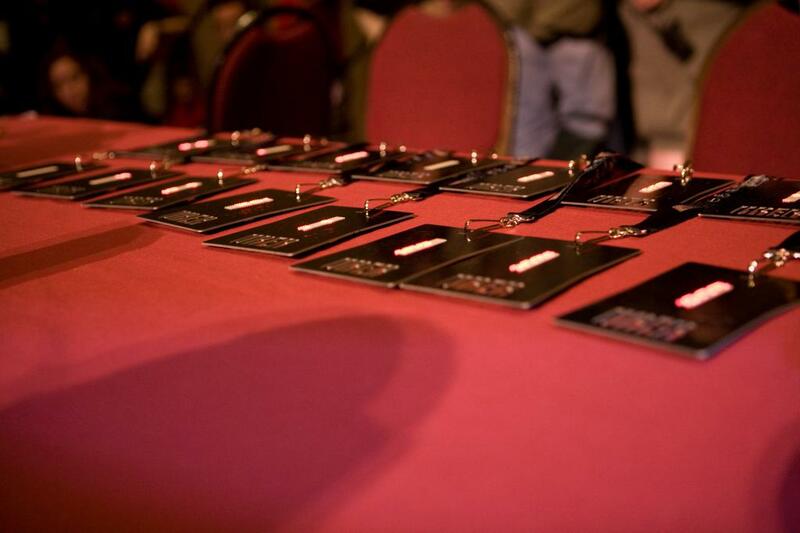 The DC11 media archives are now online... you can get real audio and video of all the talks you missed because you were too drunk to see them.